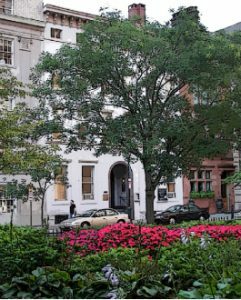 The Philadelphia Ethical Society is very fortunate to have a beautiful and historic building in a convenient and comfortable area of Center City Philadelphia, Rittenhouse Square. In addition to having our humanist religious services and various classes here, we at the Ethical Society share our building’s variety of meeting and other event spaces with others. 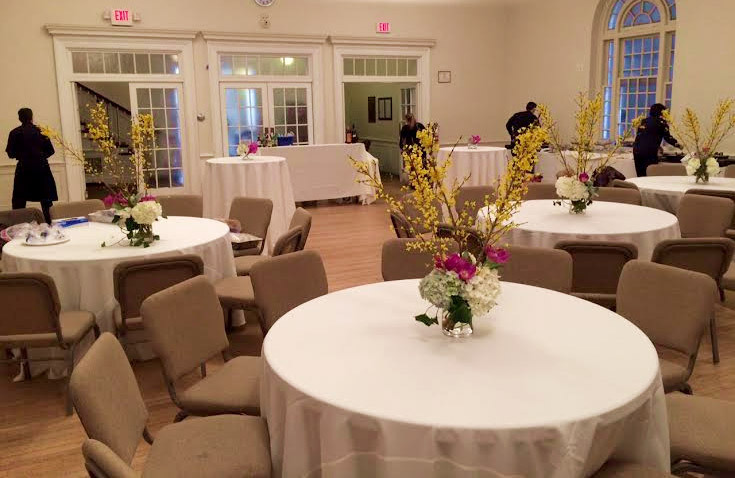 We make those spaces available at reasonable rental rates to families, cultural organizations, socially progressive groups, and others for events such as weddings, concerts, and conferences. Up five steps from the sidewalk, the Rittenhouse Square entrance leads into our lobby. From the lobby, there is direct entrance to our auditorium with a concert grand piano. Stairs from the lobby lead up to the second floor with our assembly/dining room, kitchen, and conference room. Stairs down from the lobby lead to our lower level community room. 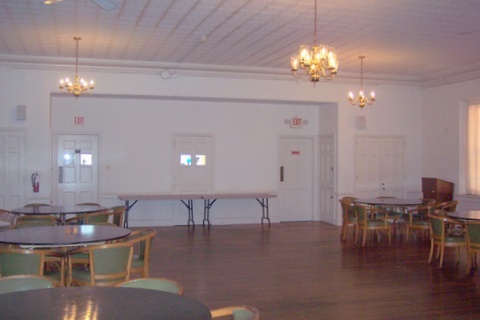 This bright and airy space with tall Palladian windows is recognized as an excellent acoustic recital hall, or we can transform it into a beautiful venue for your dinner party or other special event. Set up for dining, this space is comfortable for 100 guests, or 120 if the Lobby is also added to your rental. With theater seating the room accommodates up to 180. Rental includes all tables and chairs, and use of basic house sound system (corded mics, wall-mounted speakers, back-stage mixer). A podium is available if desired. 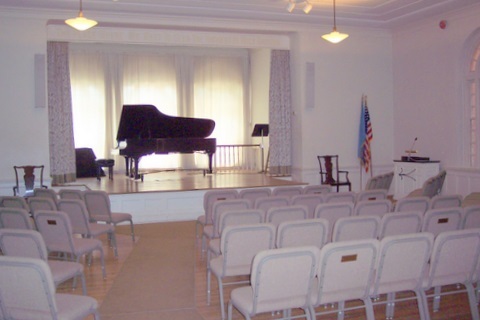 Optional rental items include our Steinway nine-foot concert grand piano; or ceiling-mounted digital projector with large screen above the stage. Additional charges apply for these items. This room is wheelchair accessible by means of a custodian-operated lift at the Manning Street entrance, and there is an accessible restroom. Regular accessibility is up 5 stairs from street level. Base room rental is $400 for a day-time or evening concert or meeting, $600 on Saturday night. Dinner parties and dances start at $625 and up. On the second level (accessible by stairs only) our Assembly /Dining Room is a budget-friendly choice for family parties, baby or bridal showers, day-long meetings, weekly dance groups, or special events. Comfortable seating for 100 guests, 100-plus for dances. Usual set-up is 6 round tables with 7 chairs each, and 3-4 buffet tables. Furniture may be cleared to the edges for dances, rehearsals, or workshops. Rental includes tables and chairs, use of basic PA system for music play-back and announcements, lectern if desired. Portable digital projector available for add-on charge. Conveniently adjacent to the kitchen for self-catering. Room is air-conditioned and has wi-fi. Base rental for the Dining Room is $265 for a half-day or evening. Please inquire for series pricing. These small-group meeting rooms on the 2nd floor overlook beautiful Rittenhouse Square. 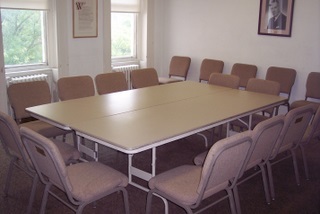 Comfortably accommodate 12 to 16 around conference tables, or up to approximately 30 for an audience-style presentation. Rooms have wi-fi and are air-conditioned. Base rental is $75 for a half-day or evening. Hourly rental is possible before 5pm. We are sorry, but the Community Room is not available for booking at this time. On weekends throughout the year, we offer a special Wedding Package where you may have exclusive use of all of our public spaces, (the main hall, 2nd floor dining room, meeting rooms and 1st and 2nd floor lobbies) for your event. If you plan sit-down dining, the maximum seating is 120 using a combination of our round and long tables. Rental includes tables and chairs (linens not included) and use of basic PA system for music play-back, if desired. Includes services of our staff event facilitator on the day of your event. You may contract with any caterer, DJ, or other wedding services that you wish to use. The services of an Ethical Humanist wedding officiant may be arranged. The time window for this package is from your first arrival to set up at 10 am, to your last departure at midnight, your reception should end no later than 11 pm. The Saturday Wedding Package is $1785, other days are $1390. Please note, as of 3/21/19, our first Saturday available for an evening event in the Main Auditorium is June 29, 2019.